UFO SIGHTINGS DAILY: Ancient Ruins Found On Mars In Crater Show Complex Structure, Jan 2018, UFO Sighting News. 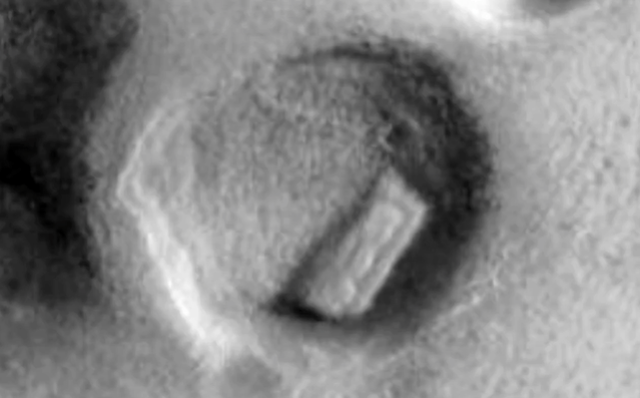 Ancient Ruins Found On Mars In Crater Show Complex Structure, Jan 2018, UFO Sighting News. This ancient structure on Mars was found by Jean Ward of Youtube this week. The structure shows right angles and even shows that it has an inner wall. The structures do look covered in Mars sand, which leads me to believe they are currently unused and have sat there for thousands or millions of years. A really mind blowing discovery. This photograph (S1801249) was taken by NASA's Mars Global Surveyor (MGS) Mars Orbiter Camera (MOC) on 2006-05-16T14:29:18.02. NASA describes this photograph as "Moreux Crater central peak." I initially found what looked like a megalithic shape cut into the side of a mound on the Martian surface. It looks rectangular with parallel lines, 90 degree angles and the shadow from two sides indicates depth. However, after some analysis and feedback from my YouTube Channel viewer Dawn, we came to the conclusion that NASA rotated the photograph by 180 degrees. Also, the preview image NASA provides for this photograph in Google Earth shows this anomaly looking like a megalith lying inside a crater, this image is correct. Directly next to the megalithic block or container/structure there seems to be two underground entrances, i.e. a round opening and a square opening. Some odd pieces of something are scattered around the two entrances. To the left there is another megalithic looking block or container/structure with right angles and a 45 degree face. Dawn furthermore noticed another anomaly I overlooked in my initial analysis. Further up to the right there is another anomaly which looks like either an elaborate doorway or entrance to an underground base or habitat, mangled machine or a broken statue/s.